Every now and then, I'll see a recipe on a food blog and just know that I need to have it in my belly ASAP. This garlicky baked rice from Annie's Eats was one of those recipes. Annie's version calls for a covered casserole dish, which I don't have, so I adapted the recipe for use in my Dutch oven. Baking in the Dutch oven resulted in a great crispy brown layer at the bottom, which I love. I served this with my Spanakopita Vols-au-Vents and a salad, but it's a versatile side that could go with pretty much anything. Preheat the oven to 375° F. Melt the butter over medium-high heat in a Dutch oven. 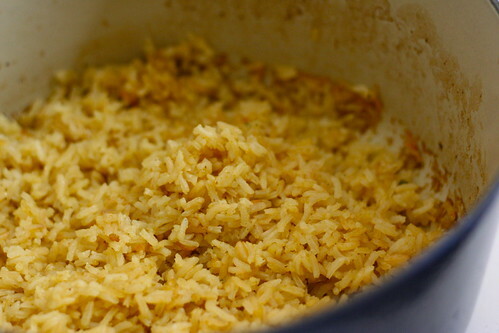 Add the garlic and rice and cook until both are golden brown, about 3-4 minutes. Stir in 1 cup of the chicken broth and bring to a boil. Cover and bake for 25 minutes. Stir in the remaining chicken broth and bake, covered, for 30 more minutes or until all the liquid is absorbed. Stir in a squeeze of fresh lemon juice and serve warm. Mmm, this looks good. It reminds me of something my parents made when we were growing up, "oven rice." Sounds pretty similar, except that this has garlic (a serious plus, in my opinion). I like the idea of the squeeze of lemon juice at the end! Thanks for sharing this--I'll be making it soon. Yum! Going to try this one! Yummy! This sounds wonderful =D. I love my rice!